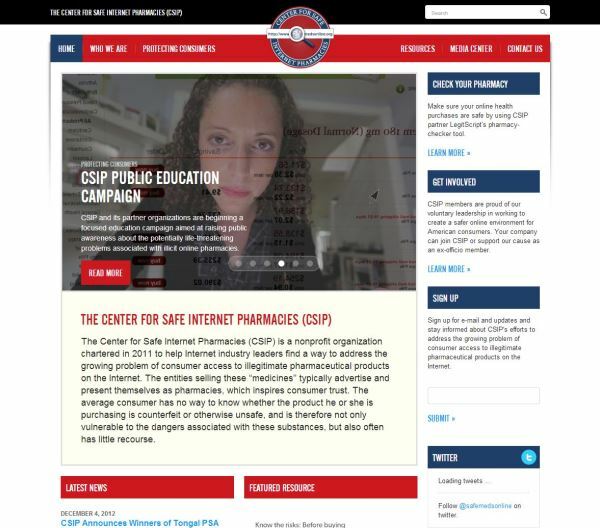 The mission of the Center for Safe Internet Pharmacies (CSIP) is to promote and encourage safe online pharmacies through education, enforcement, and information sharing. CSIP provides a neutral forum for sharing relevant information about illegal internet pharmacies among members. It aids law enforcement efforts where appropriate and has established a publicly available list of all safe online pharmacy websites. CSIP also educates consumers about how to find safe medicine online through partnerships with government leaders, regulators, law enforcement, public health and consumer groups, and health care providers. We have worked closely with CSIP since their formation in 2011 and 2012, establishing their web presence, brand marks and logo. We have also coordinated efforts to promote the work of the organization from their initial 2012 launch at the White House through public awareness videos and regular collaborative engagement with their team. We ensure that curated and relevant information and resources, as well as news and other materials are made available on their website, presented with graphic design that represents their organization, and promoted via various forms of social media as well as occasional e-newsletters. We work with CSIP to identify possibilities for strategic growth and promotion, and to implement that strategy within a set monthly budget.